Australian breast cancer patient Danielle Javernig, a 43-year-old mother of twins, chose not to let her diagnosis and treatments get her down. The brave woman withstood months of intense treatments to rid her body of any breast cancer, and she swore if she made it to her last day of chemotherapy, she would do something special. So, Javernig decided to dress up as Wonder Woman, with the rest of the staff joining the party in celebration. Javernig learned of her diagnosis in May 2015 after she went to her doctor with sharp, stabbing pain and a lump in her left breast, notes the Brisbane Times. When the tumors had failed to shrink after three months of chemo, the doctors decided to operate. Javernig underwent a mastectomy and had 32 lymph nodes removed from her arm. In the middle of receiving various treatments, the Brisbane resident learned even more troubling news. One of her mother’s aunts had died of breast cancer in her 40s, and then three of that aunt’s daughters had also died of breast cancer. Javernig then found out she had the BRCA 1 gene mutation, which increases the likelihood of breast cancer by 80 percent. She pressed on. 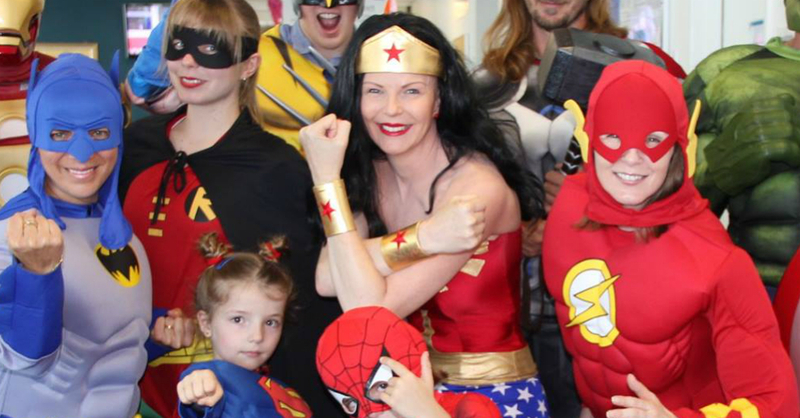 Wonder Woman was Javernig’s first costume as a kid, and she and her brother played dress up as superheroes when they were young; this inspired her decision for her last day of chemo. On Nov. 17, 2015, Javernig appeared as Wonder Woman, and her girls showed up as Spider-Man and Superman. Staffers at the wing of the hospital joined in, dressing as Captain America, Hulk, Batman, Wolverine and others. The cancer survivor was an inspiration to everyone at the hospital! Perhaps Javernig gained her inspiration from a fellow cancer patient. Back in February 2015, 3-year-old cancer patient Sophia Sandoval wore her Wonder Woman costume on the last day of treatment, too. Learn about her story here!